Our QES1500 Series Open Frame color LCD monitors are packaged in rugged steel chassis and are especially well-suited for installation in industrial process control consoles. This versatile RGB LCD monitor features multi-format Plug & play capability, enabling it to interface easily with a wide variety of video display systems. These rugged, high performance, Active Matrix COLOR TFT LCD computer monitors are designed for heavy-duty industrial process control applications. With contrast ratios exceeding 700:1 and brightness levels of 450 cd/m2 the QES1500 Open Frame Series color TFT LCD displays are good choices for most of your industrial display needs. Standard features such as multi-language on-screen display, DDC1/2B Plug and Play, and wide viewing angle capability make these versatile. RGB LCD monitors are a good choice for many industrial and medical imaging equipment. The wide range of synchronization of 15KHz to 100KHz make this unit excellent fit for legacy products, as well. CRT monitors are slowly becoming obsolete, and many of these older CRT display monitors are no longer supported by the original equipment manufacturer. Unfortunately, most LCD monitors simply will not work in these older systems. Now there is a solution. Dynamic Displays offers an affordable and fast LCD display solution to customers having these older control systems. We can configure any of our QES1500 Series Open Frame flat panel displays to operate at horizontal frequencies lower than the VESA-standard VGA formatted signals. In addition, we offer a number of configurations that enable these high-quality LCD displays to function with the older 3, 4, and 5-wire signal inputs often found in older, legacy control equipment. 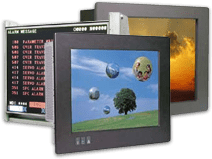 This means we are able to offer customers a modern LCD display monitor that can replace your old CRT display in you existing legacy industrial control system. Special mounting hardware for CRT replacement applications is also available, so the new LCD display will drop right into the existing CRT mounting holes with no need to modify your sheet-metal. Our Industrial Open Frame LCD display also have the option of Capacitive, Resistive or SAW touch screen with USB or Serial interface. With all its features, the QES1500 series open-frame LCD monitors are designed to give integrators and OEMs a reliable Industrial LCD monitor.